The successor of Willy Vandersteen as artist/writer of Suske en Wiske was born at May 16, 1937 in Turnhout, Belgium. From his early years he follows the footsteps of his predecessor. The similiarities in both their lifes are remarkable. For example: he goes to the same primary school as Vandersteen and, just like him, joins the youth-movement in Flanders. But where Willy always stayed with Scouting, Paul changes that organisation after a year for the Chiro-youth. Later on he attends classes at the same academy of arts where his teacher has studied. In addition to all this he also works for some time as window-dresser for the department store Innovation in Antwerp. At the time that he was a member of the Chiro-youth Geerts already regularly made drawings for various magazines that were published by that organisation. Most of those are individual illustrations and short comics. At this time however, he also made a story from about 34 pages called De verdwenen Smirrel. This story has, after being printed in both the girl- as the boys-magazines of the Chiro, also been published in "De Gazet van Antwerpen". On May 1, 1967, he was working as a printer at the time, Paul decided to try his luck and went to see Willy Vandersteen. A map full of examples from Paul's earlier work was looked at by Vandersteen. Although he liked the drawings he didn't immediately offer Paul a job. But Geerts had his mind set on being a comic book writer and therefore kept bothering Vandersteen at the time after that first visit with phonecalls and more visits. Finally his persistence resulted in him inking some drawings of Vandersteen, as a test. When that inking was judged allright he got a script that he had make into a comic strip. The result of all this was that Paul Geerts got his assignment. In January, 1968 he started working at Studio Vandersteen. At the beginning of this stage in his career he mostly worked on the Jerom-stories for Germany. This series was very popular in that country. A new strip had to be published every week, which meant that the employees for the series had to work hard. Initially Paul Geerts merely did the inking of the drawings. 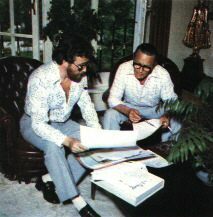 After some time though, he began to supply scripts which increased his influence on the series. All these activies did not pass unnoticed from Willy Vandersteen. Therefore he asked Geerts to come and work for the Suske en Wiske series. Paul gladly took that offer en that's why, after two years working at Studio Vandersteen, he started this new challenge in his career. Just like with Jerom, he again started with the inking of the pencildrawings, which in this case ofcourse were supplied by Willy Vandersteen. His work was very much to the liking of Willy Vandersteen, and soon the latter appointed him as his successor as artist of the most important series from his oeuvre. De gekke gokker is the first story that Paul Geerts was completely responsible for. In the years that followed he increasingly developed his own style, which by the way linked so well with the drawings of his predecessor that the general public never even noticed the switch to a new artist. Paul Geerts made the series slightly more realistic. The faerie aspects, which are so characteristic for many Suske en Wiske stories, were however certainly not forgotten. As could be expected at a production of four albums a year, not all the stories that have been published since Geerts took over have reached the same level of quality. He got much criticized about the fact that the albums didn't seem to have the same spirit as in the earlier years, the stories were judged to sterile. On the whole, however, one can see that the stories kept getting better while he got more accustomed to the series. Sales figures never suffered from all the criticism. Since Paul Geerts took charge of Suske en Wiske the popularity of the series only increased. Nowadays every new album is published in a total number of 400,000 copies. Some highlights from the works of Paul are: De raap van Rubens, Angst op de Amsterdam, De rinoramp, De parel in de lotusbloem and certainly De 7 schaken. Although Paul Geerts has been the main responsible person for Suske en Wiske since 1972, his name only got noticed by the general public much later. From the album De krachtige krans (1989) he finally got the recognition he deserves with the mention of his name as artist/script writer at the titlepage. Paul Geerts works up a lot of personal experiences in his stories. His journeys, all over the world, often are a starting point for yet another exciting adventure. The story Robotkop, that will be published as an album in 1996, is based upon an operation that Geerts went through. At this operation a tumor was removed from his brain. In the story the same happens to Lambik. The latter becomes apparently dead and gets into heaven where he meets various acquaintences from earlier adventures. At the time that Vandersteen drew Suske en Wiske he sometimes let himself play a cameo role in the stories. Paul Geerts continued this tradition. The first time he surfaces is, as a shy artist, in De gladde glipper. Furthermore he appears in De Belhamel bende. His most important appearence however takes place in the jubilee-story De 7 schaken. In that adventure he plays the role of "mysterious disguised person" which appears in many Suske en Wiske stories. In this disguise he makes Suske, Wiske and their friends have an adventure in the Antwerp of the 20's, together with Willy Vandersteen. His own identity is only revealed at the very last picture. Which, by the way, makes it to be the first time in many years that an adventure isn't concluded with a wink from Wiske. Paul Geerts has worked many years at the Suske en Wiske series. But in Versus no. 53, which was published in April 2001, he wrote in his column that even for him the years are beginning to take their toll. Het tires sooner than before and can't work anymore as long as he used to do. Considering his health conditions Paul is stepping down with regard to Suske en Wiske. In agreement with all parties involved it was decided that Marc Verhaegen will carry the main responsibility in the future. From now on Paul Geerts will act mainly as an assistant and advisor for Marc. At the fanclubday of "De Fameuze Fanclub" on April 22 2001 Paul told the main public for the first time that he stops working on the regular Suske en Wiske-stories and that Marc will continue the series. At the moment that Paul Geerts wrote his column he probably didn't know yet that the publisher had far reaching plans with Suske en Wiske. 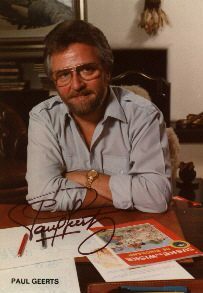 Even before the Versus which continued his article was deliverd to the members of De Fameuze Fanclub the media announced that the cartoonist Erik Meynen was hired by Studio Vandersteen to help modernize Suske en Wiske. Paul Geerts wasn't pleased with this developments. In a reaction to the Dutch newspaper "De Telegraaf" he said: "It's not wise to change so drastically two comic book characters that live int the memories of every reader. Maybe you can gain 10.000 new readers with the changes but you may also loose 10.000 old ones. Even now I'm getting reactions that Suske en Wiske aren't the same anymore."